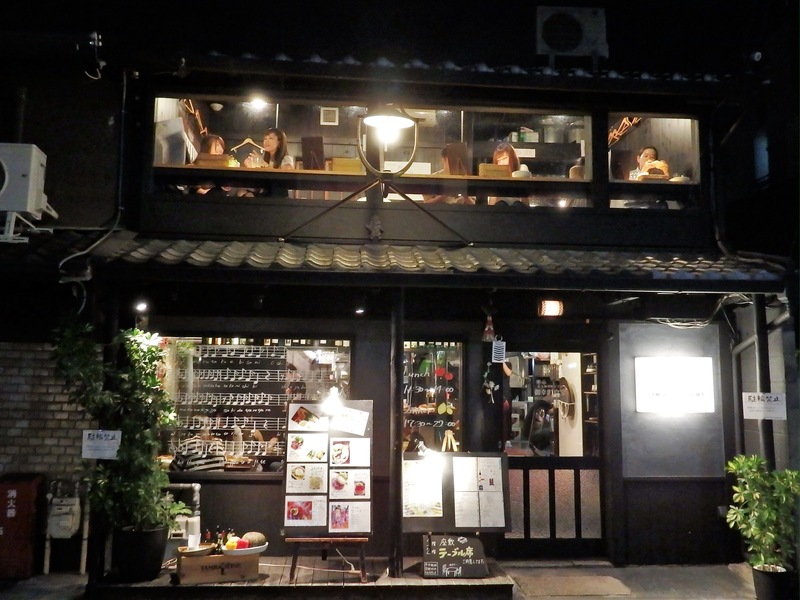 Kyoto is full of famous sightseeing spots, but wandering around in the evening, looking for just the right restaurant, is an attraction of its own. I strongly recommend that you do not eat dinner at your hotel or ryokan. The neighborhoods listed below have great atmosphere, are very safe at night, and are full of restaurants & bars that offer a wide range of cuisines and prices. I have enjoyed some of my favorite meals in restaurants located in these neighborhoods that I stumbled upon by accident. 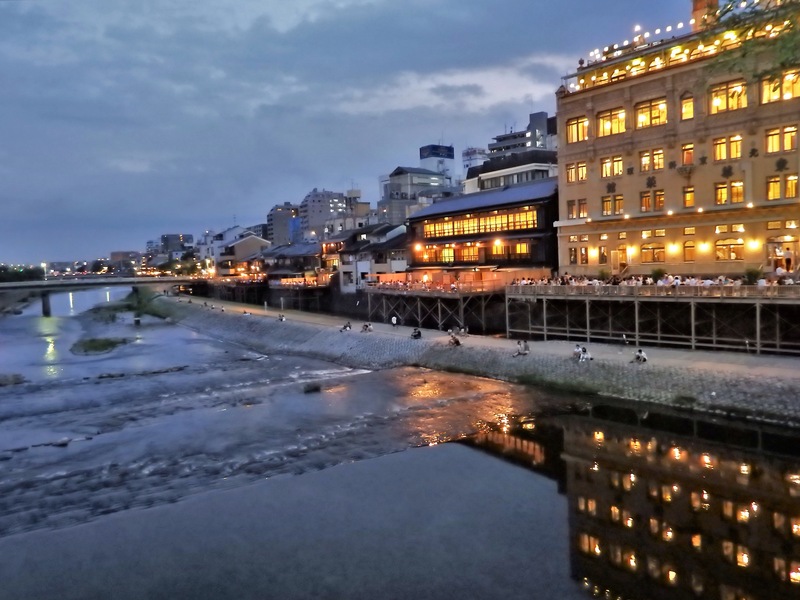 If you have a specific restaurant in mind, or would like to sit on an outdoor balcony along the Kamogawa River, then you should make reservations in advance. However, even in this case, I’d recommend exploring a bit – perhaps for a ‘pre’ or ‘post’ dinner drink. 1). Pontocho is a narrow alley that runs just beside the Kamogawa River, between Sanjo-dori and Shijo-dori. The alley is lined with cool restaurants, bars, and teahouses where Geiko & Maiko entertain. 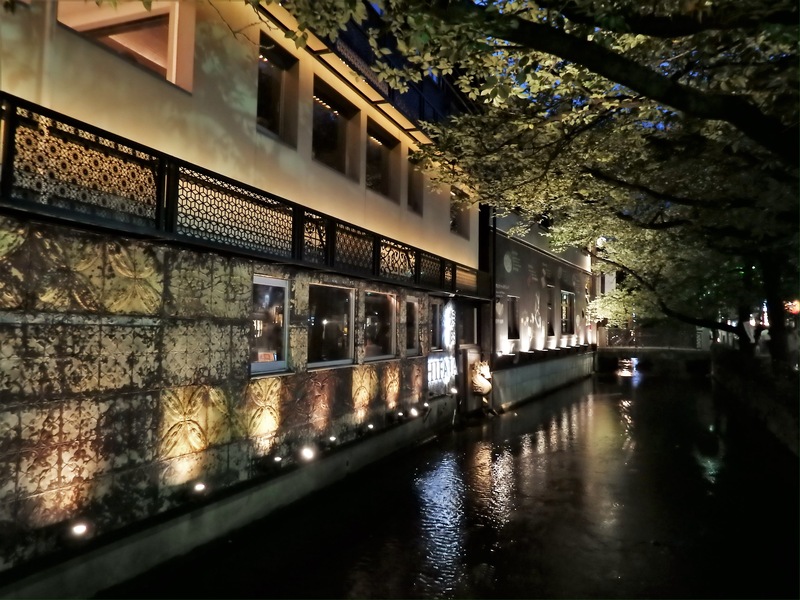 Many of the establishments on the Kamogawa-side of the alley have a view of the river, and in the summer, they offer outdoor seating over a shallow canal that runs parallel to the river. If you walk along Pontocho, some restaurants advertise that they have an English menu. One of the best reasons to wander here is for the opportunity to see Geiko & Maiko popping in and out of the places where they live and work. 2). Kiyamachi-dori is a one-way street that runs beside the Takase River (now a shallow stream – the photo below). Hundreds of restaurants & bars line the street between Nijo-dori and Gojo-dori. It runs parallel, and just one street over, from Pontocho. Between Nijo and Sanjo, Kiyamachi-dori sits between the Takase River and the Kamogawa River. There are many excellent restaurants in this area, including some with outdoor seating over the same shallow canal I mentioned above. The section of Kiyamachi-dori between Sanjo and Gojo is Kyoto’s Roppongi. Many of the restaurants on this stretch of the street belong to a chain and/or are reasonable and well suited for anyone on a tighter budget. 3). Gion is the most famous Geiko & Maiko district in Kyoto. It is split into two halves by Shijo-dori. Most people are familiar with the southern side. There are many top class restaurants here along Hanamikoji-dori and the narrow alleys leading off of it. This is also a good area to spot Geiko & Maiko walking to and from their places of work. 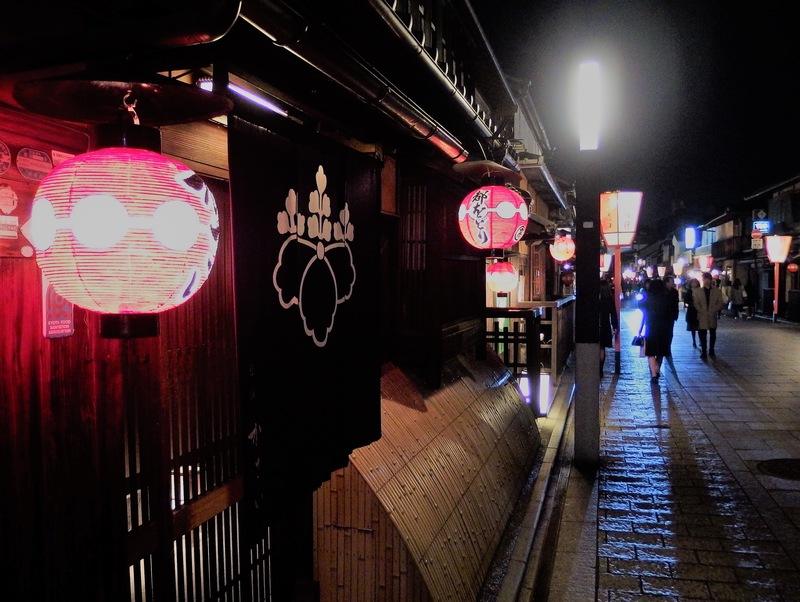 The northern side of Gion has a number of restaurants that are hidden among buildings full of hostess clubs, tiny bars, and some slightly seedy establishments. Also in this district, along the Shirakawa River, are a number of really nice restaurants. Don’t worry about the seedy places. Unless you go looking for trouble, the area is extremely safe. 4). Within the district of Higashiyama, in the alleys off of Nene-no-michi, are many amazing restaurants housed in traditional wooden buildings. Even if you don’t eat here, the area is especially beautiful when lit up at night. 5). The neighborhood around The Museum of Kyoto is full or restaurants, shops, hotels, traditional inns, residences, and more. Karasuma-dori lies to the west, Teramachi to the east, Sanjo-dori to the north, and Nishiki Ichiba to the south. Restaurants in this area tend to be more reasonable. *Keep an eye out for posts on specific restaurants within these neighborhoods.